When a father is taken away from his family and facing deportation, his children are left to grieve and wonder about what comes next. Maricela, Manuel, and their mother face the many challenges of having their lives completely changed by the absence of their father and husband. Their day-to-day norm now includes moving to a new house, missed soccer games and birthday parties, and emptiness. 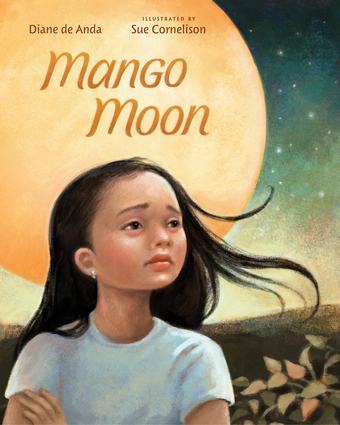 Though Mango Moon shows what life is like from a child's perspective when a parent is deported, Maricela learns that her love for her father continues on even though he's no longer part of her daily life. Diane de Anda is the author of three bilingual picture books and has two new books being published by Simon & Schuster this year. She works as a professor in the Department of Welfare at UCLA. Sue Cornelison is the author and illustrator of many children's books. She relishes her time with family, coaching her tumbling and trampoline team, and playing wildlife photographer when she isn't illustrating.